Her first construction will probably be a monolith. She sure chilly-chilly; She positively glow-glow. Oh come on, couldn’t you have just pointed out that you’re a kid allowed to do adult stuff? Chilly down with the Fierys! Think small with the Fierys! Walk tall with the Fierys! When your thing gets wild, chilly down…! Also there is no way revealing she is a stunted Jin’Sorai Echo will end badly. At all. Ever. Not even a tiny chance. ….and the witch hunt begins. I want him to turn on his own echo powers and go “mine is bigger”. Ever notice how a kid, when carefully schooled to not do something – not to tell their classmates there is no Santa Claus for example – will immediately go out and do just that their first chance to do so? It seems to be especially pronounced when you tell the kid NOT to tell the other kids. Proof positive regardless of species or intelligence, kids are morons. yah… I’m starting to get it better now that I think about it. Group-ist. If there aren’t groups in one way, you’ll make groups in another way. It’s important to note that some of these groups are different from others. Knowing someone is a girl or black doesn’t tell you as much about them as being a budhist or republican would. Still, your point is a good one: There’s a difference between groups whose membership is optional and groups whose membership has nothing to do with choice. Racial makeup and gender are obviously not choices. Another telling debate is whether membership in a given group restricts your life choices (e.g. a woman must marry and have babies, or a white person shouldn’t have any friendships with minorities. If you think you don’t live in a racist country, ask someone whose skin is a different color from yours. Never trust a spiteful child with private information. I wouldn’t be surprised if this was brought up in the comments before and I’ve just forgotten about it, but… well, everyone getting upset with the government over revealing sensitive information to a 9 year old… she’s an echo, and the colony needs all the help they can get. I’m willing to bet that the government was pressured into bringing her to the village by that the leader of the village (Gien, right? Sorry, bad with names x.x). It’s quite possible that Sarnothi children are usually better at keeping secrets due to cultural reasons, and the Sarnothi don’t realize that culturally, human children are terrible at keeping secrets. Caveat here, as a child I had it drilled into me that secrets are meant to be, well, secret. I believe there were episodes from various little-kids shows that covered how telling a secret that someone told you can lead to hurting the person who told you the secret (Mr Rogers definitely, possibly Care Bears, Seasame Street, and Reading Rainbow as well). And when I was five, I accidentally revealed a couple secrets and made people upset, so by the time I was in first grade, I understood quite clearly that secrets are not to be told. However, I didn’t always know when something was supposed to be kept secret unless I was specifically told not to. Children’s shows now have to balance that with ‘Sometimes you SHOULD tell that secret.’ e.g. “Uncle Ron told me he’s broke his own arm on purpose because it’s the only thing that makes him feel alive” or “someone touched me in a bathing suit area and didn’t want you to know”. Welp, Selkie’s going to be grounded forever. Well, that little bit of showing off didn’t seem to take much effort at all! Seems being motivated (by the opportunity for a dramatic retort) does wonders for Selkie’s access to her ability. So hey… is Mina still overhearing this conversation? For Lunar: try Kahmith.com if you’re u want to binge read a great comic. 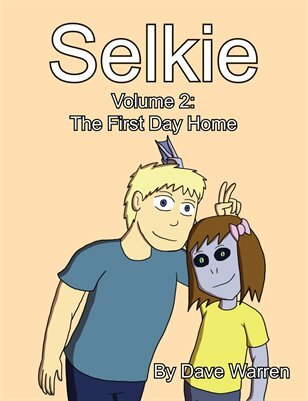 It is currently available until next August, and like Selkie, is one of the best on the web. Thanks for the recommendation. Not that I’m looking for ways to waste time (I seem to be pretty good at finding those on my own), but I’ll check it out. Hm. She lasted longer than I expected. Oooh boy, she might have tipped her hand a bit too far on this one, if he puts together the “building” comment. He MIGHT not, since it wasn’t said in Sarnothi, but still. And nix that – I completely overlooked the glowy-eyes at the end there. Que Fall Out Boy song, My Songs Know What You Did in the Dark. Pretty sure there was a rule somewhere about not displaying that in public, Selkie. Oh, kids. You do the darndest things. …A NECRON Monolith. It shoots lasers. Where DOES the “Bla No” “BLA YES” thing come from? It’s not just kids, people in general do that. Whatever you do, don’t think of a pink elephant. I still don’t know why so many people are running around playing the version where you can only lose. But I guess they’re getting *something* useful out of the experience, or they wouldn’t still be doing it.